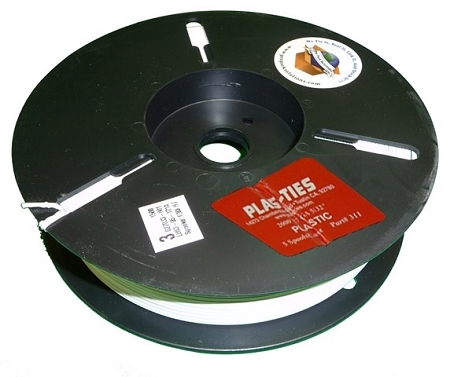 Plasties 311 twist tie material is a Plastic/Plastic with a 27 gauge wire. The 8 1/2" X 2" spool holds 2000 feet. The width of the material is 5/32". This price is for five spools. We will tape two cases together to save on freight. 311 material is only available by the case. We will ship collect on your UPS or FEDEX account. Call or email for details. Twist Tie material is not included in free shipping.